The history of a repetitive prayer-counting device is thought by scholars to predate the rosary by almost 2,000 years. Ancient desert dwellers used rocks, sticks, or knotted cords to count the proper number of prayers. 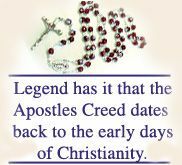 Legend has it that the Apostles Creed dates back to the early days of Christianity, to the Apostles themselves on Pentecost. It began in its present form in the seventh century, but was not added to the rosary until the late 16th or early 17th century. Priests and monks of the early Church prayed an early form of the rosary based on the 150 Psalms or Psalter. Since most of the laity of the time could not read, they prayed and chanted 150 Our Fathers instead of the Psalms. Jesus himself gave us the Our Father as Saint Matthew tells us in his gospel message. Through the course of time, the 150 Our Fathers slowly gave way to 150 Hail Marys. They in turn were broken up into decades separated by the Our Fathers. The words of the Hail Mary come to us from various Scripture passages, Church councils, and additions of prayerful phrases through the centuries. The Glory Be to the Father is thought to have taken form in the fourth century, but it did not become part of the rosary until a much later date. In the fifteenth century, mysteries were designated to each of the decades. The mysteries chronicled events in the life of Jesus. Even those who could not read could meditate on these mysteries and come to know the stories in the Bible. In 2002, Pope John Paul II added the Mysteries of Light to the rosary. From humble roots, the rosary has grown to become a powerful prayer—most famously evidenced by the Christian fleet’s victory over the Turks at the Battle of Lepanto in 1571. The rosary has been credited with many healings, conversions, and other miracles of faith down through the succeeding years. We know it today as our Lady’s favorite prayer. I encourage you to pray the rosary daily.